Beautifully designed and interesting project Forex King with is us and paying well for more than 50 days. If we can believe statistics than project overall has been online for 1200 days and we can say thanks for that to the "sleepy" phase of this project. As you know, project Forex King comes with a quality mark, and our industry well accepts it. 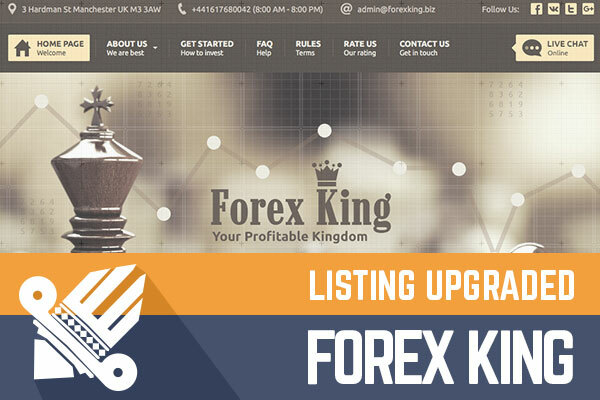 The administrator has already reached a lot, but it is evident that he wants to continue in the same way and upgrade to Golden Stage position marks new round for advertising campaign of Forex King project. At this point if we observe Alexa rankings than it is clear that project has grown enormously, and line in the graph is almost vertical. If we take in mind that in HYIP industry total amount of players is just a few thousand than judging from Alexa data that I was talking about it is evident that administrator with this HYIP now is targeting people that are not regular HYIP players and most likely in this project is tens of thousands, active investors. If you are interested in this project remember one golden rule - invest only that you can afford to lose. AvaTrade is the best forex trading platform for beginning and professional traders.